In ancient times, a fabled colonist by the name of RimRue taught her people the art of packing meals to eat on the go, and all was well in the universe. But during the era of Beta 18, that skill was lost, and pawns had no choice but to moan and cry whenever they had to eat without a table. But rejoice, for now, the stars have aligned, and the technology of packing bagged lunches has been rediscovered! Tired of your pawns being in a bad mood because they ate without a table? With the Packed Lunches Mod now they can turn meals into packed lunches, and eat happily wherever they happen to be. Additional Credits: Obviously, credit is due to RimRue, the creator of the original A17 version of the mod! 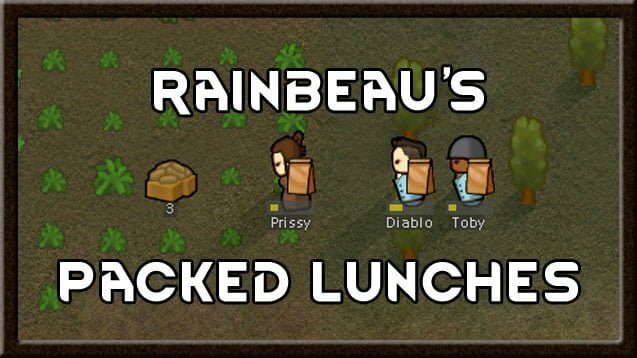 License: If you’re a modpack maker and want to include “Packed Lunches” in your pack, or if you’re a modder and want to use it as the basis of a derivative mod, please feel free to do so. But please let the author know beforehand, and be sure to credit both him and RimRue. Whether they’re working on the field, or travelling the world, there are times where your pawns will need to eat far away from their tables. For those occasions, the Packed Lunches Mod comes with these cute bags to eat food on-the-go that will prevent them from feeling upset.